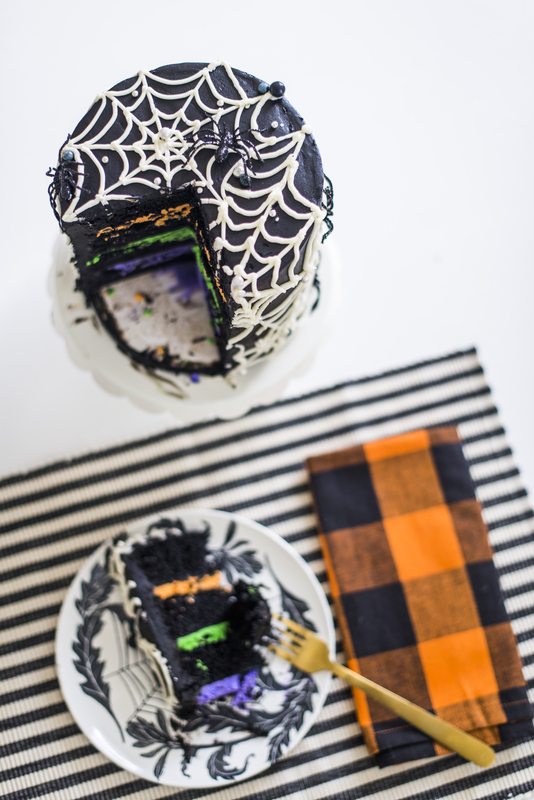 The most spooktacular black chocolate cake made up of rich, dark chocolate cake layers, whipped vanilla buttercream and black fudge frosting. I’m so excited about this cake, you guys! 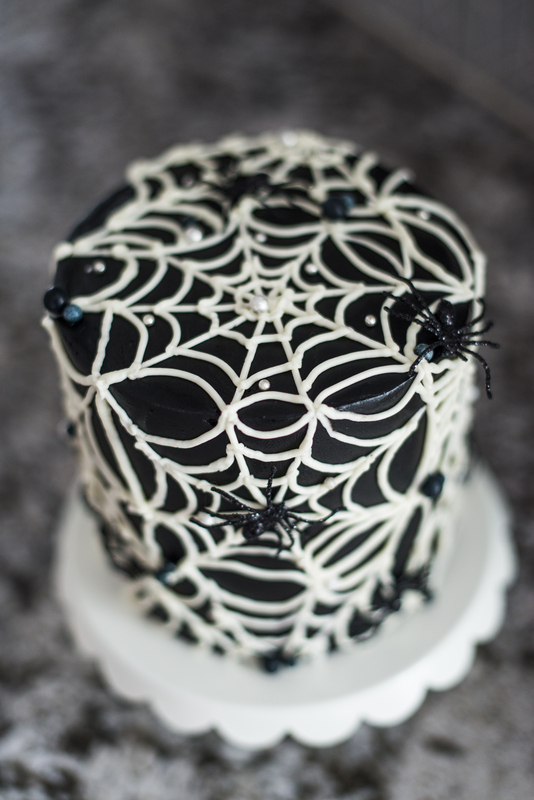 It not only tastes amazing, but thanks to Sweetapolita’s black fudge frosting recipe, you can actually get a true black frosting without the fear of dying all your guests’ teeth black. You’ve had that fear before, right? No? Just me? It actually wasn’t just a fear. I actually did dye all my guests’ mouths black at Westin’s 3rd birthday party. At the time Westin was hugely into superheroes and asked for a Batman cake. Not knowing nearly as much as I do now, I thought using a vanilla buttercream base was the best way to tint any frosting. Ha! 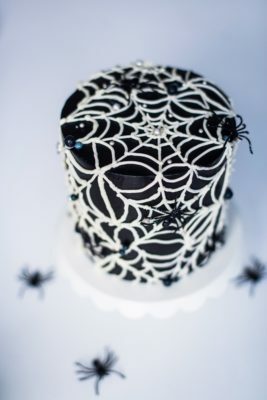 I had to use SO much black food gel to turn that white frosting black that a single bite of the cake quickly tinted everyone’s mouths’ completely black. I couldn’t believe it! Well, actually I could based on how much food gel I knew went into that frosting – so I guess a better way to say it is, I was so embarrassed! Since then, I haven’t even thought about making black frosting. That is, until now. 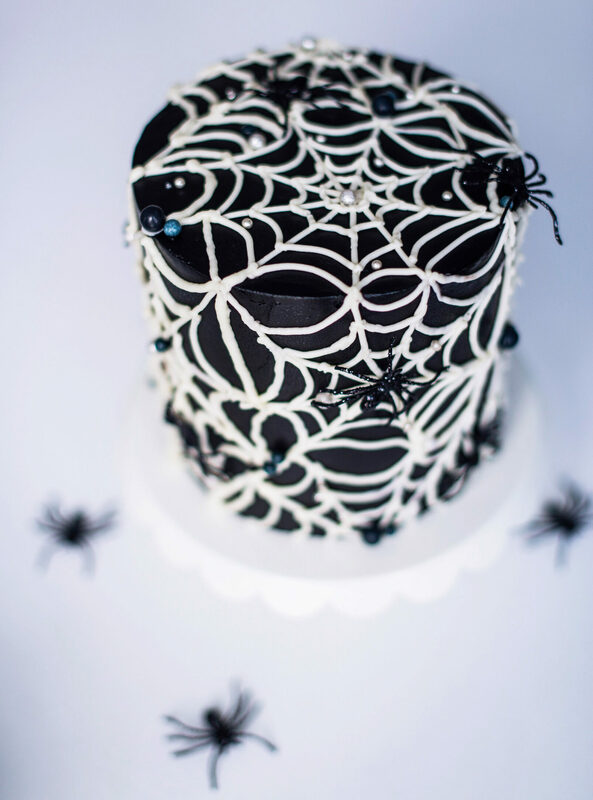 Last year, one of my favorite cake bloggers, Sweetapolita, published her Glam Rock Cake. It’s a black chocolate cake with black chocolate frosting. It’s gorgeous! But more importantly, it uses very little black food gel and claims it won’t dye your mouth black! 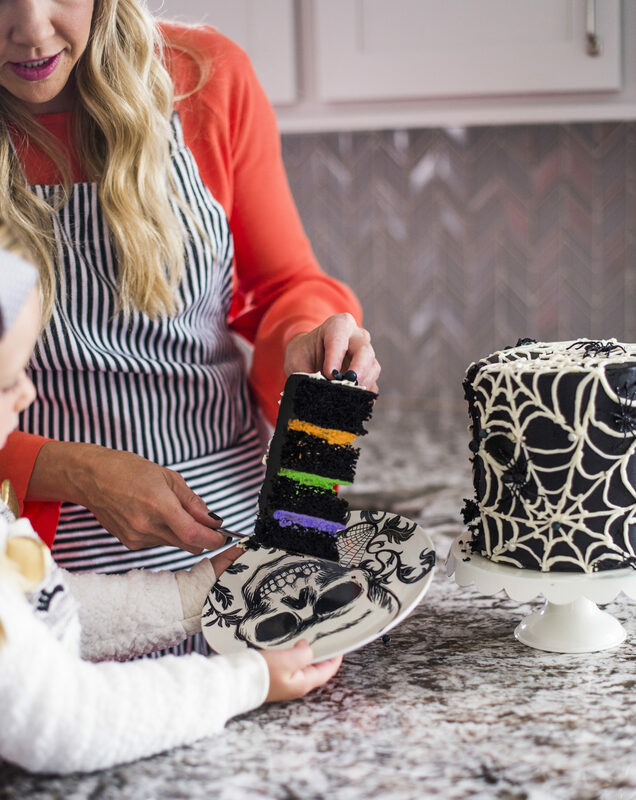 I’ve been dying to test out this recipe and Halloween seemed like the perfect time! The key to making this frosting truly black, is black cocoa powder. Guittard makes a Noir cocoa powder but you have to buy it in a pretty big package. I’d recommend getting THIS black cocoa powder from Amazon. As an alternative, you can use dark cocoa powder like Cacao Barry Extra Brute Cocoa Powder but it’s likely you’ll have to use a little more black food gel. Another crucial step to this frosting recipe is the waiting time. After you mix your ingredients and add the black food gel, you need to let the frosting sit for a while. The frosting will darken as it sits. Sweetapolita recommends waiting about 15 minutes when you use the black cocoa powder. I tried this frosting with a dark cocoa powder and learned that you’ll need much more time for the frosting to turn black. If you’re using dark cocoa powder instead of black cocoa powder, I’d suggest making the frosting a day before and letting it sit overnight in the fridge to turn black without having to add too much food gel. If you store your frosting in the refrigerator overnight, you’ll need to get the frosting back to room temperature before frosting your cake. I don’t recommend heating your frosting, but instead, letting it get to room temperature by sitting at room temperature for a few hours. Clearly, that all sounds like a lot of extra time. Thus, I highly recommend using the black cocoa powder to make your life a lot easier. I used my whipped vanilla buttercream to till the cake, with orange, green and purple food gel to tint each layer. Cutting into this cake might have been my favorite part of making this cake. 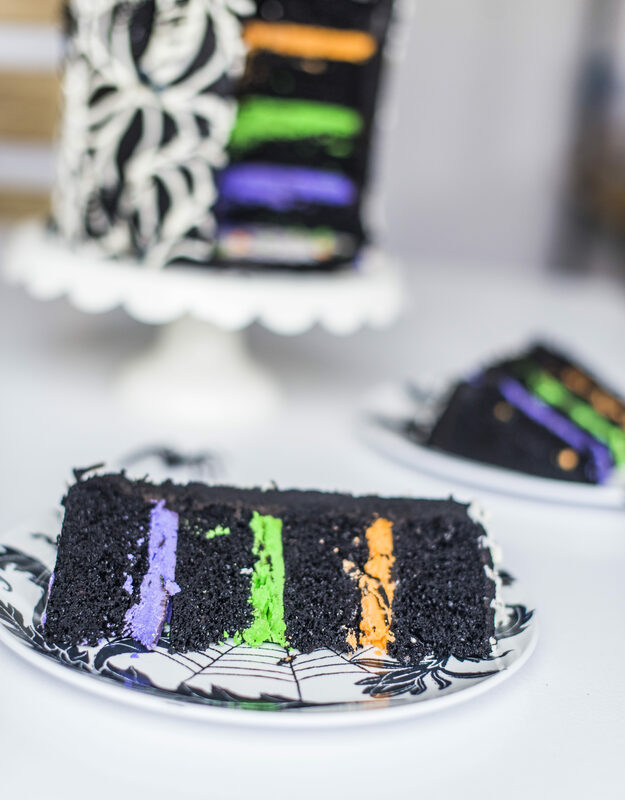 I mean, look at those colors and how beautifully they contrast with the black cake! The black cake is just a little twist off of my favorite chocolate cake recipe you see on here all the time. Westin wanted to show off his white teeth here, but I spy some chocolate cake still in his mouth! 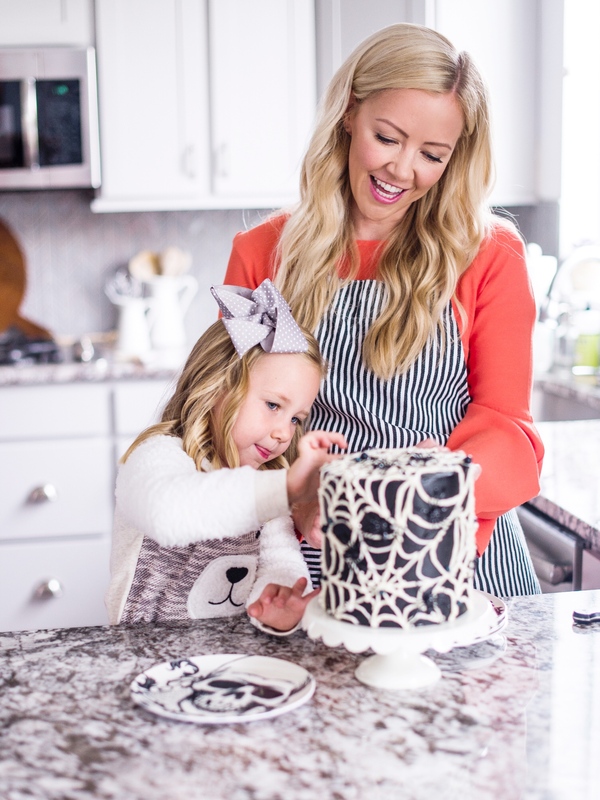 I can’t wait for you to make this cake and to see what you do with your black frosting! For a little extra help, I’ve put together a quick video to show you how the frosting is made, as well as a time-lapse video showing you how to assemble the cake. Rich dark chocolate cake layers with whipped vanilla buttercream and black fudge frosting. Preheat the oven to 360 degrees F. Spray four 6-inch round cake pans with nonstick spray. (You can also use three 8-inch pans). Line the bottom of each pan with parchment paper, then spray the pans again. In another bowl, combine the buttermilk, oil, eggs, water, and vanilla. With the mixer on low speed, slowly add the wet ingredients to the dry. Mix until just incorporated. Scrape down the sides of the bowl. Add the food gel and mix for another 20 seconds. Pour the batter into the prepared pans (about 11 to 12 in each of the 6-inch pans or 15 to 16 ounces in each of the 8-inch pans) and bake for 16-18 minutes. In a bowl of stand mixer fitted with paddle attachment beat the butter on medium speed until light and fluffy, about five minutes. In a separate bowl, sift together the powdered sugar and cocoa powder. Reduce the mixer's speed to low and add the powdered sugar, cocoa powder, water, sour cream, vanilla, and salt to the butter. Beat until incorporated, about 1 minute. Increase the speed to medium and beat for two more minutes. Add the melted chocolate and beat on medium speed until smooth, about one minute. Add 1 teaspoons of black food gel. Beat until combined. Sweetapolita recommends just letting it sit for about 15 minutes because the color will take awhile to process and it's best to let it sit rather than adding more and more right away. I noticed my frosting took much longer than 15 minutes to darken. I like making this the day before assembling the cake, so that it has plenty of time to absorb the black food gel and turn black. If by the next day the frosting still isn't black, add another teaspoon of food gel, stir and let it sit for another 30 minutes or so. With the mixer on low speed, slowly add the powdered sugar, followed by the vanilla, salt and heavy whipping cream. Turn the mixer to medium-high and beat the frosting for about five minutes, until lighter in color and texture. Place a cake board onto your turntable. Apply a small dollop of frosting onto the cake board and smooth it out with an offset icing spatula. Place the first cake layer on top of the thin layer of frosting which will act like glue to hold the cake in place. 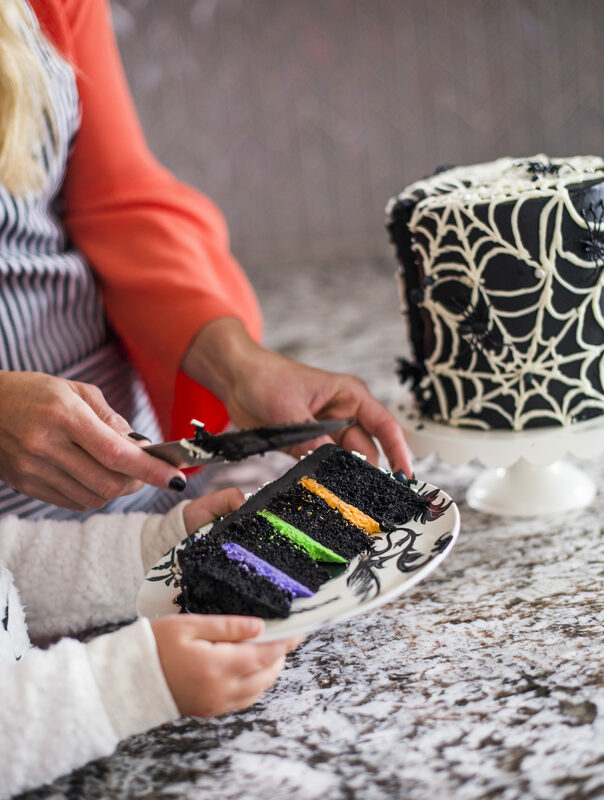 Evenly spread your first color of frosting on the cake layer, making sure to get eye level with the cake to ensure you're layer of frosting is even. Continue to stack and frost the layers until the last cake layer, which you'll place top side (crumb side) down on the last layer of colored frosting. 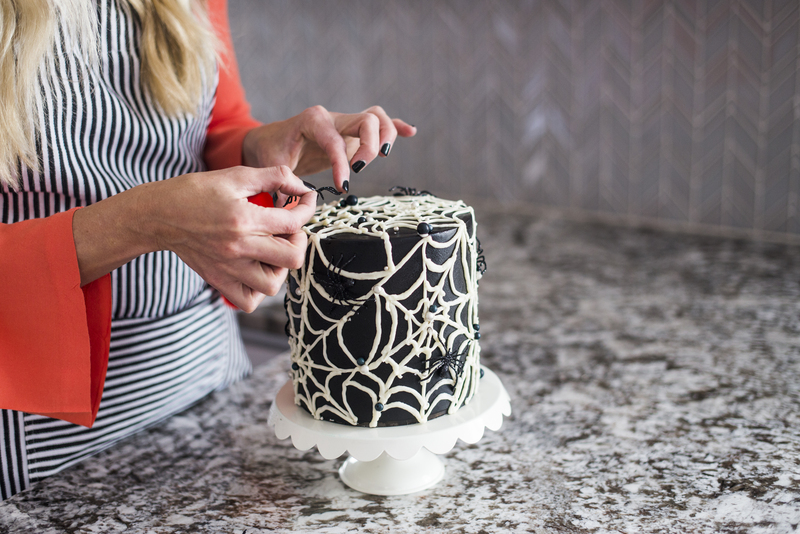 Apply a thin coat of black frosting around the entire cake, making sure to cover the entire cake from top to bottom. Freeze the cake for 10 to 15 minutes to lock in the crumbs. When the frosting is set and the crumbs are locked in place, continue to frost the cake with the remaining frosting. This chocolate frosting tastes delicious but is so runny! How do you keep it thick enough to actually spread and stay on cake? Yes, it’s pretty soft and if it’s too soft to spread for you, just refrigerate it for about 30 minutes to solidify the butter a bit. Hi Courtney! 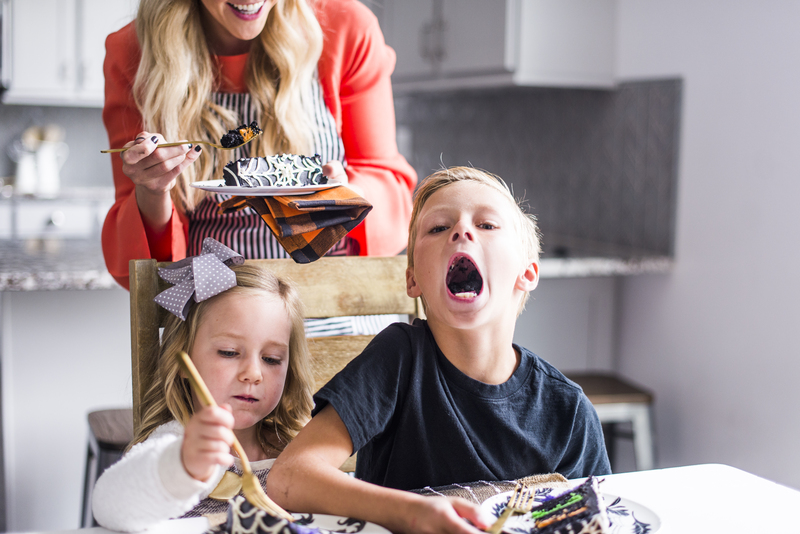 I want to use this recipe to make a batman cake for my son’s birthday (like you! But no black teeth haha) Can I make it three layers instead of four with 8 in cake pans? What should I adjust the cooking time to? Yes, you can make three 8-inch cake layers and there’s nothing you need to change.